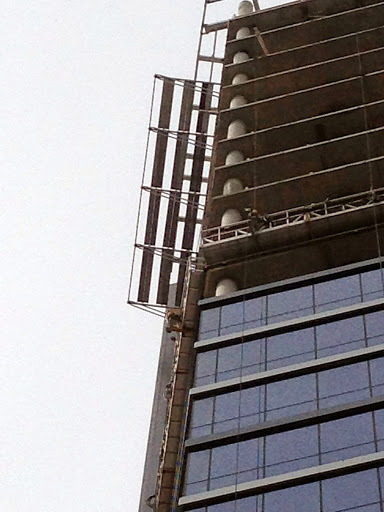 How would you describe working 28 floors up, protected by only your safety harness…? I’ve seen it but luckily I don’t have to be the one assembling it. 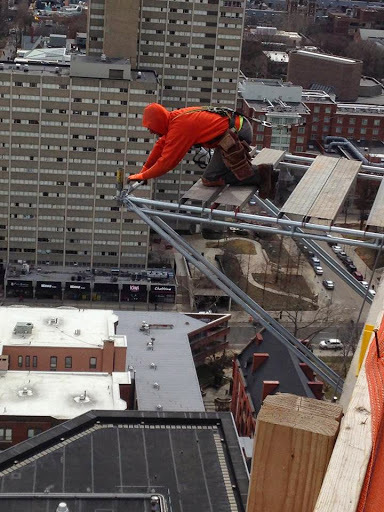 I have the utmost respect for our crew guys that do this everyday. 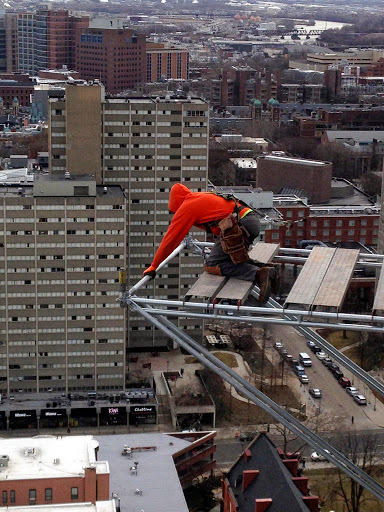 It can get hairy “up air” so our guys have to be extra careful. Winds and elements can have a big effect on erection. 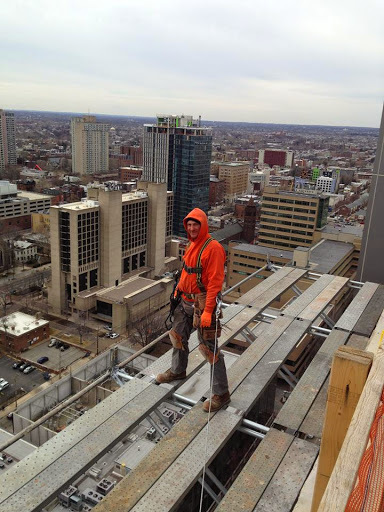 Superior Scaffold was called in to help crews get to the steel super structure on the outside of the top of this new building construction at 3601 Market Street. 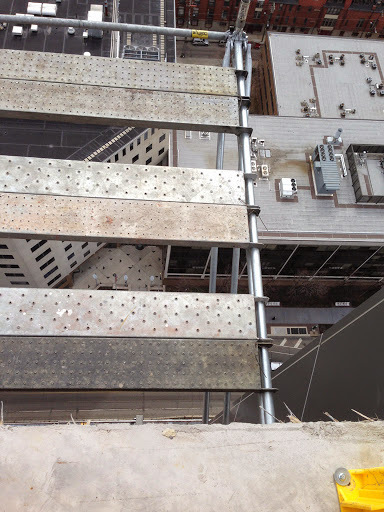 If you look to the top right of the photo provided by the GC – Intech – you can see where our cantilever system was being installed. 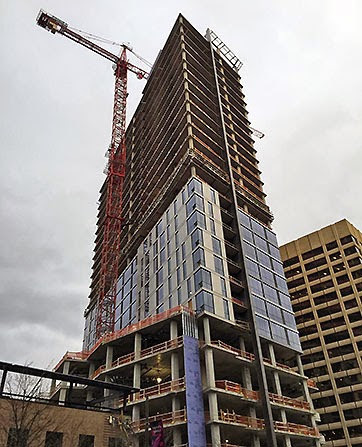 This 28-story mixed-use development will consist of ground floor retail space, five levels of parking to accommodate 201 cars, and 23 floors of residences. The 363 residential units will be a combination of studio/efficiency and one-and two-bedroom apartments. A rooftop amenity level with an outdoor pool deck is also planned. 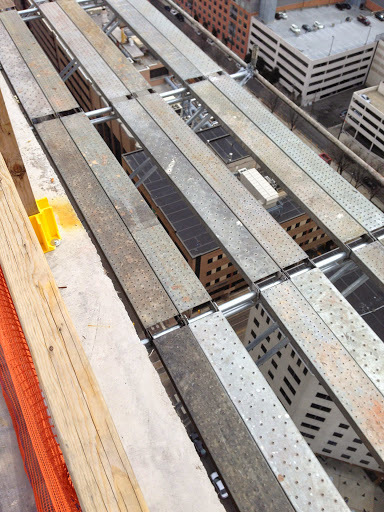 The initial thought was a traditional cantilever system using aluminum beams, stringers and joists like we’ve done many times before… but smarter heads prevailed and proposed this system scaffold cantilever. It’s lighter, easier to set up, and more efficient. Crews needed to get to the outside of this super structure to skin it and finish it. You can see in the wide shot the shiny metal structure at the top of this building. 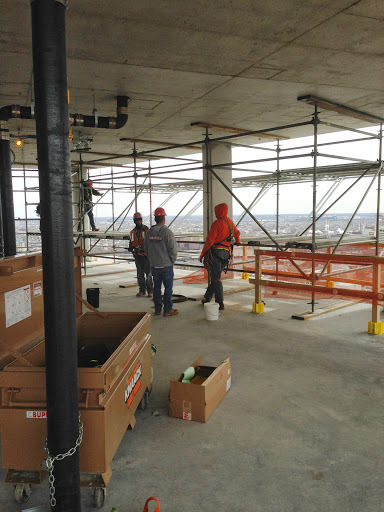 One of the benefits of using system scaffold is that the base structure or shape can be assembled on the existing floor and then shoved/lifted out into place, and then the other components can be added on. This was a U shaped design with a 220 foot long run on the 36th street side by a 40’ run or return on the Market Street side and then a 12’ run on the Filbert Street side. Each one of the decking planks also has to be tie wrapped or tie down so it won’t shift or lift in the wind. 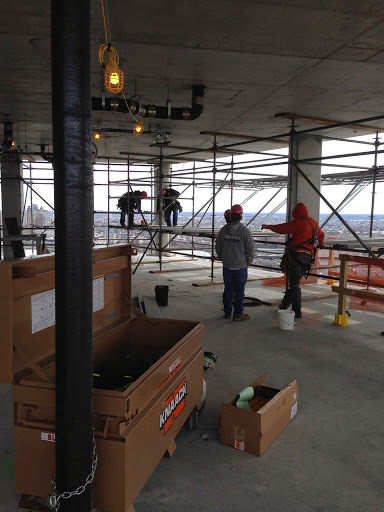 Some other challenges included the fact that the buck hoist (also referred to as Construction Hoist, Personnel and Material Hoist, Man-Lift, Temporary Elevator, Material Lift, Rack & Pinion Hoist, etc) was being used all day so our crew had to wait until after hours to load in the equipment. This entry was posted on Friday, March 20th, 2015 at 9:37 am	and is filed under News & Updates, System. You can follow any responses to this entry through the RSS 2.0 feed. Both comments and pings are currently closed.